Chicken Ole’ is a quick and easy one pot meal that is ready in about 30 minutes. 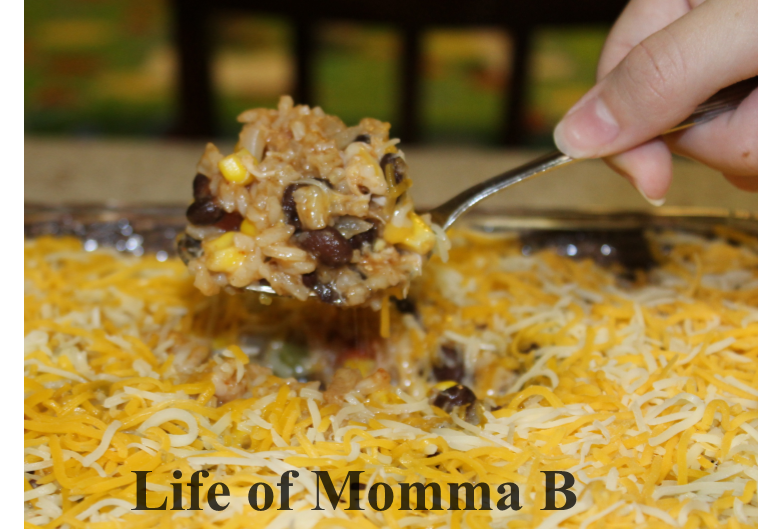 It satisfies my family’s love for Mexican food with a combination of rice, black beans, chicken and corn. Served with a side of tortilla chips and it is a full meal. In a 12 inch skillet heat oil until it begins to simmer. Add rice and spices and saute for one minute. Add all the remaining ingredients, except cheese. Bring to a boil, then reduce heat and simmer for 15 to 18 minutes until all the liquid is absorbed and rice is tender, stirring occasionally. Remove from heat, uncover and fluff with a fork. Sprinkle with cheese and serve. If you prefer not to serve from the skillet, move it to another dish before adding the cheese. TIPS: You can substitute frozen bell pepper and onion mix to reduce the prep time. Also this recipe works great with left over turkey from Christmas or Thanksgiving. If you do not have homemade chicken stock on hand substitute one 15 oz can plus 2 Tablespoons of water. This entry was posted in Recipes and tagged black beans, chicken, corn, gluten free, main course, one pot meal, rice. Bookmark the permalink.